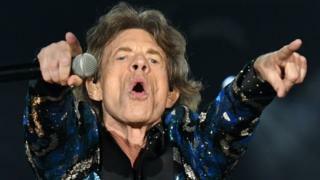 The Rolling Stones frontman Sir Mick Jagger has said he is "on the mend" and "feeling much better" after receiving hospital treatment. The singer has reportedly undergone heart valve replacement surgery. In a tweet Jagger, 75, thanked hospital staff "for doing a superb job" as well as fans for their messages of support. The band postponed their tour of the US and Canada after Jagger was advised by doctors that he needed medical treatment. US gossip website Drudge Report was the first to report that Jagger would need surgery to replace a heart valve. The story was also reported by US music magazine Rolling Stone. The Rolling Stones were due to kick off a 17-concert tour in Miami on 20 April, before travelling across North America until a finale in Oro-Medonte, in Ontario, Canada on 29 June. The band are working with promoters to reschedule the shows. Jagger previously apologised to fans for postponing the tour, writing that he was "devastated" and would be "working very hard to be back on stage as soon as I can".